URBANA – In evaluating the bioactive compounds of Illinois blueberry and blackberry wines, University of Illinois scientists have found compounds that inhibit enzymes responsible for carbohydrate absorption and assimilation. And that could mean a tasty way to help people with diabetes decrease their blood sugar. “We’re thinking about a dealcoholized fermented fruit beverage that would optimize the inhibition of the alpha-amylase and alpha-glucosidase enzymes and also make use of the wines’ other healthful bioactive components,” said Elvira de Mejia, a U of I professor of food chemistry and food toxicology. “Preliminary studies have indicated that anthocyanins may have a positive effect on cognition and overall brain health while protecting against some of the effects of aging, such as Alzheimer’s disease and memory loss. 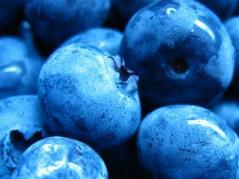 These berries have some very intriguing components,” de Mejia said. Studies detailing this research were published in a recent issue of the Journal of Food Science, with Michelle H. Johnson of the U of I’s Division of Nutritional Sciences as co-author, and in the Journal of Agricultural and Food Chemistry with the U of I’s Michelle H. Johnson, Anita Lucius, and Tessa Mayer as co-authors.